Hot pink and white polka dot plastic table covers, banquet table cloths and more such as Hot pink and white polka dot: beverage napkins, lunch napkins, dinner plates, lunch plates, paper cups, banners, flags, paper straws, paper chains, party hats, balloons, crepe streamers, gift bags, loot bags and cello bags. 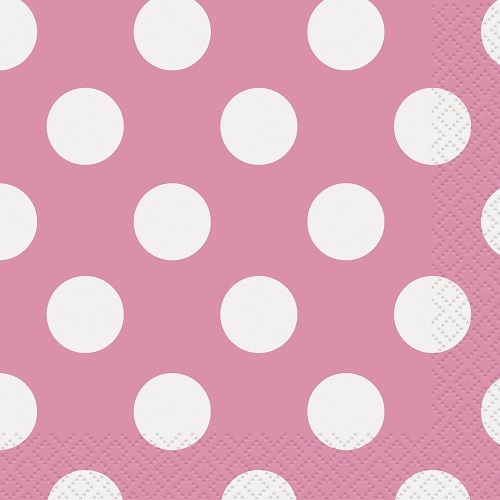 Every thing in hot pink polka dots that you could possibly want. Polka dots are patterns consisting of an group of circles, usually of the same size and spaced closely in relation to their diameters. Polka dots are most commonly seen on many items such as clothing, toys, and fabrics. Polka dots became common on clothing in the late nineteenth century in England.